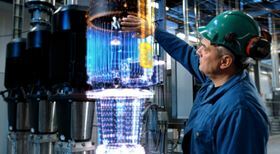 Combining data from Grundfos and Siemens gives improved error prediction. Grundfos and Siemens are collaborating on a new project to combine data and algorithms from Grundfos pumps and the Siemens motors which are driving them. The project, for meat processing company Danish Crown, means that Grundfos can provide the company with more specific direction about how to deal with changes in pump or motor behaviour. Søren Bro, chief digital strategist at Grundfos, said that combing data from the company’s pumps and data from Siemens’ motors along with two sets of underlying algorithms and applications, had helped it to become better at predicting errors, such as problems with bearings or blowouts. The data from Grundfos' pumps and Siemens’ motors are collected in Siemens’ open IoT-platform Mindsphere, where algorithms work together to determine the best decision when a component is behaving differently. New addition to Grundfos' portfolio of intelligent pumping solutions.